At Dot, we honor and respect military veterans. We’ve increased the number of veterans hired to Dot Transportation tenfold in the last ten years. Here is another feature of just one of our amazing veterans in truck driving. Mt. Sterling, Illinois driver Glenn Bristow voluntarily joined the military in a time when it wasn’t very popular to do so, and without the blessings of his family, as he was the only son. But for Glenn, it was the right thing to do. In August 1966, just a couple of months out of high school, his adventure began and Glenn was sworn into the U. S. Army and sent to Fort Leonard Wood, Missouri for basic training. After graduating from basic training, Glenn continued through his Advanced Individual Training learning his trade as a heavy equipment engineer. He was transferred to Fort Benning, Georgia to go through the demolitions specialist and airborne courses. Glenn completed the demolitions course and was in week two of three at the airborne course when they pulled him out of training and transferred him to the 20th Combat Engineers attached to the 5th Special Forces Group stationed at Fort Bragg, North Carolina. After being on the ground there for six days, Glenn was shipped out for the A Shau Valley area of Vietnam in September 1967. Upon his arrival in Vietnam, Glenn was assigned his 10-ton truck, lowboy trailer, and his D7 bulldozer. During the first 16 months in the country, part of his responsibilities was to build and maintain Landing Zone Snoopy and Landing Zone Gloria, two of the helicopter landing areas in the area. He also helped build the Landing Zone Dawn airfield for bigger fixed-wing aircraft. In May 1969, he was assigned to the 63rd Engineer Company Light Equipment where he spent the next eight months building the main road through the area connecting multiple forward locations including Hamburger Hill. Glenn most appreciated meeting the very friendly native hill people called Montagnards which the Americans often mispronounced as “Mountain Yards.” In French, Montagnard meant mountain dweller, and they called themselves the Dega. He fondly remembers trading everyday things with them. For instance, the soldiers usually always had soap, so they would trade their soap for fresh eggs, which as one might imagine, were hard to get over there. A New Career in the U.S. In December 1969, he was transferred back to Fort Bragg and was discharged in January of 1970. Glenn was awarded the Vietnam Service Medal, a Purple Heart, and the Bronze Star for his service over those four years. Before joining the service Glenn had worked in the family market, so upon his return, he took a job with Eisner’s Food Stores in Champaign, Illinois as a clerk and worked his way up to night manager. It was in 1978 that he went to driving a truck full time at Anderson Clayton Company in Jacksonville, Illinois, for whom he drove for just over 33 years. In 2011 Glenn was persuaded by DTI part-time driver George Estabrook to join the DTI family as a transfer driver, and he hasn’t looked back since. 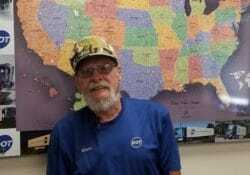 In total, Glenn has driven for more than 41 years and over 5 million miles. Glenn shared that his experience in the military provided him with a strong foundation for his life by forcing him to grow up and instilling a sense of responsibility, of self and service. His said it also helped him develop a very strong work ethic and ability to work in a team environment. He asserts that the discipline and leadership skills he learned while serving which have both served him well throughout his life and during his tenure with DTI. Glenn and his wife of 39 years, Shirley, live in Chatham, Illinois, about 75 miles from the Mt. Sterling facility. They have three adult children and seven grandchildren. Glenn said he really appreciates getting to see the country and always meeting new people working for Dot/DTI and said it is very reminiscent of the military. In his off-time Glenn enjoys fishing and HO Model Trains. He said he has 30 steam engines, over 300 train cars of all types and enough track to fill an oversize garage. From all of us at Dot and Dot Transportation: Thank you Glenn and all of our great veterans for your service to our country! Are you a veteran in search of an exciting and fulfilling career as a truck driver? Apply to Dot Transportation today!